I have had the honor of being Dr. Baddar’s nurse for about ten years now. I started with the practice in 2005 and when his nurse was transferred I was happy to take the position in 2009. He is an incredible educator and a wealth of information. 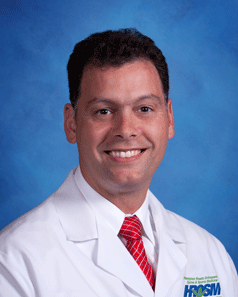 Dr. Baddar has been practicing in the area since 2004. He did his fellowship at the Cleveland Clinic for knee and hip replacement and revision surgery. While the majority of his practice is joint replacement surgery, he does do quite a bit of general orthopaedics including fractures and outpatient arthroscopic surgeries. We have an amazing team that consists myself (his nurse), Shannon Holloman, PA-C, Stacey, Medical Assistant and Linda our surgery scheduler. Everyone works as a unit to get patients taken care of in a timely and efficient manner. We have all been working together so long I feel like we are family and I hope our patients get the same feeling from us. One of my favorite things about Dr. Baddar is his honesty. Even though he is a surgeon his answer is not always surgery if it is not in the patient’s best interest. He has a very conservative approach and is willing to give our patients all of the information they need to make an informed decision, leaving them in charge of their care. One of the things I hear him say daily is “You are the boss. I am your hired help”.